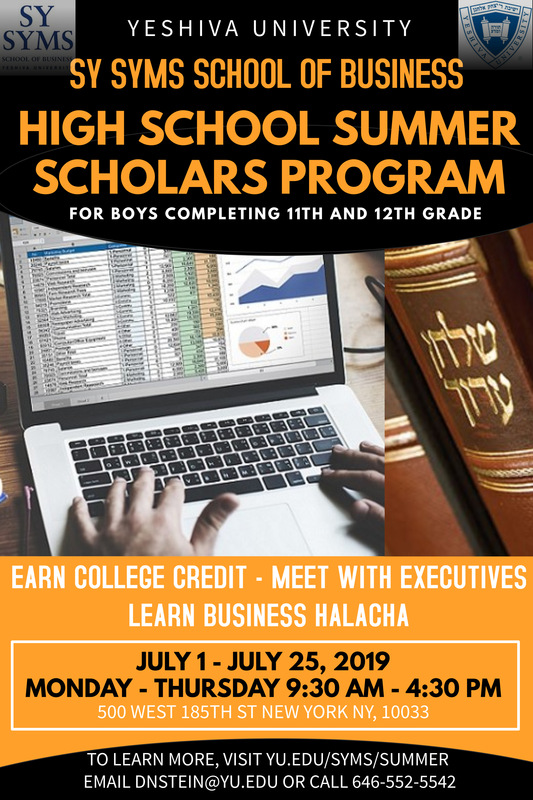 The Sy Syms High School Summer Scholars Program provides motivated high school students with a first-hand introduction to the world of business while earning college credit and learning Torah intensively. Students will take the Sy Syms School of Business core curriculum course, Introduction to Information Systems (IDS 1020 - 3.0 Credits), which will focus on the basic principles and techniques of spreadsheet modeling and quantitative analysis, teaching skills that are necessary for many industries and sectors of business. Together with Rabbi Daniel Stein, Rosh Yeshiva, RIETS, students will learn in depth about the halachot relevant to navigating the business and professional environment. In addition, participants will be visiting a variety of financial institutions and businesses to get an appreciation for the broader business atmosphere and have the opportunity to meet with accomplished executives who will share some of their expertise and wisdom. Monday, July 1, 2019 - Monday, July 22, 2019 (there will be no sessions on Thursday, July 4, 2019). 9:30 - 11:30 am - Business Halacha with Rabbi Daniel Stein in the YU Beit Medrash. 11:30 am - 1:30 pm - Lunch break on YU's Wilf Campus, with twice weekly visits with business professionals. Tuesday, July 23, 2019 and Wednesday, July 24, 2019 will be independent study days followed by the final examination for Introduction to Information Systems on Thursday, July 25, 2019. Only students who successfully pass the course will earn 3.0 credits. Participants should be motivated yeshiva high school boys who are completing their junior or senior year of high school, and live within commuting distance to Yeshiva University's Wilf Campus, located at 500 West 185th Street, New York, NY 10033. Transportation will not be provided, however, upon request, there will be assistance in coordinating transportation. The application deadline is March 1, 2019. After March 1, 2019 there will be a period of rolling admissions depending upon availability. This program and course will only be offered if there is sufficient enrollment. Tuition for the program and course (including all fees) is $2,895. Financial aid is not available for summer programming and courses. For more information, please contact Rabbi Daniel Stein at dnstein@yu.edu or 646-552-5542.